It is suggested that this incredible dessert was invented in 1867 to commemorate the purchase of the Alaskan Territory by the US from Russia. 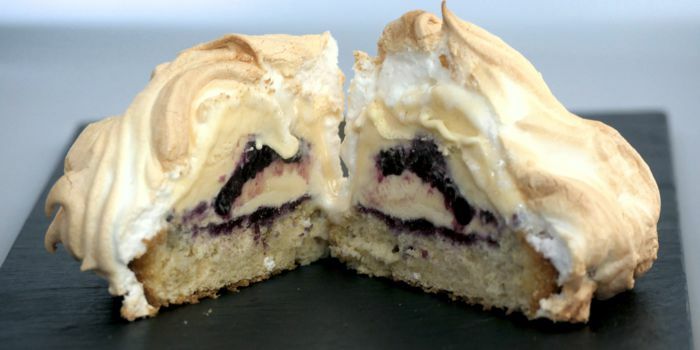 Whatever the origin, the idea of ice cream sitting on a sponge cake and encased in meringue is a brilliant one. Preheat your oven to 160° C (320° F) fan/convection, 180° C (356° F) conventional, gas 4. This is a simple fatless sponge. Separate your eggs. Whisk the egg yolks with the sugar and vanilla extract for about 3 minutes until the mixture is smooth and creamy. In a separate bowl (ideally attached to a stand mixer), whisk the egg whites to stiff peaks. In yet another bowl, mix the flour and baking powder together. Stir half of this into the egg yolk mixture, then fold in half of the beaten egg whites. Add the rest of the flour, stir in, then fold in the remaining egg whites. Prepare your individual or big cake tins (I used small quiche tins with removable bottoms and fluted sides) by generously greasing them with butter. Pour batter into tins and bake for 20 minutes, turning halfway through to get an even colour. When baked, remove from tins and place on a wire rack to cool completely. This step is optional, but I wanted to get good height on my alaskas so I decanted vanilla ice cream into small pudding bowls. For a touch of luxury, scoop out a teaspoon-sized hole in the centre, fill it with jam, and cover the jam with more ice cream. Put the pudding bowls in the freezer for at least an hour to solidify. When you are ready to assemble the alaskas, pour 4 egg whites into the bowl of a stand mixer and beat until you have stiff peaks. Slowly add the sugar while continuing to beat the mixture. It should become very stiff and glossy. Preheat your oven to 180° C (356° F) fan/convection, 200° C (392° F) conventional, gas 6. Your sponges will likely have a slightly domed top, so cut that off to make a flat top. Spread with jam, then tip out the ice cream onto the sponge. Using a palette knife, spread a thick layer of meringue all over it. Make sure there are no holes in the meringue. Using a fork, create swirly patterns in the meringue. If you don't want to bake them at this point, you can keep them in the freezer for a couple of days, otherwise, stick them in the oven for 8 minutes. Serve immediately. The video above is from the Keef Cooks YouTube channel. Click here to see the video recipe of Baked Alaska on YouTube. Prep time: 20 minutes. Chilling time: 2 hours. Total time: 2 hours 28 minutes.